Substance use among adolescents and young adults has been declining recently except for one substance- nicotine. In the United States, Electronic Nicotine Delivery Systems (ENDS) are being used in record numbers to consume nicotine, with nearly 2 in 5 students in 12th grade reporting past-year vaping. 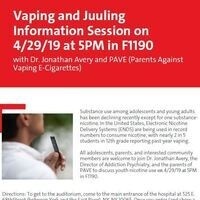 All adolescents, parents, and interested community members are welcome to join Dr. Jonathan Avery, the Director of Addiction Psychiatry, and the parents of PAVE (Parents Against Vaping E-Cigarettes) to discuss youth nicotine use on 4/29/19 at 5PM in F1190. Once you enter the hospital and show a photo ID, proceed straight to the information desk and turn right. Proceed to the "Payson" elevators, which are on the right side of the hallway. Take the elevator to the 11th floor and follow signs to F-1190. For more information, contact Dr. Jonathan Avery at joa9070@med.cornell.edu.